Larry Cohen has had a long, storied career. He started out as a writer in the 1950s, then became a director and producer a bit later. Cohen’s lengthy television career is explored here, revealing just how much influence and impact he’s had on the small screen with shows like The Invaders, The Defenders, and Coronet Blue. The story of Cohen’s career in TV was previously unknown to me, as I suspect it has been to many of those who know him primarily for work in directing, on such films as It’s Alive, God Told Me To, Q: The Winged Serpent, and Black Caesar. We also learn about Cohen’s close relationship with legendary composer Bernard Herrmann, and how Cohen wasn’t only the last person to see Herrmann alive, but that he discovered his peaceful corpse. In fact, It’s Alive is Herrmann’s last score. As you may guess, it’s fantastic. For sooooo much more info on this doc, read Kurt's original Fantasia 2017 review here; my interview with director Steve Mitchell here; and my rather illuminating interview with Larry Cohen here. The Blu-ray itself looks and sounds fine, and the content is relentlessly entertaining. If you’re a Cohen fan or want to learn about the finest guerilla film tactics around — or at least what you used to be able to get away with in public — get King Cohen. 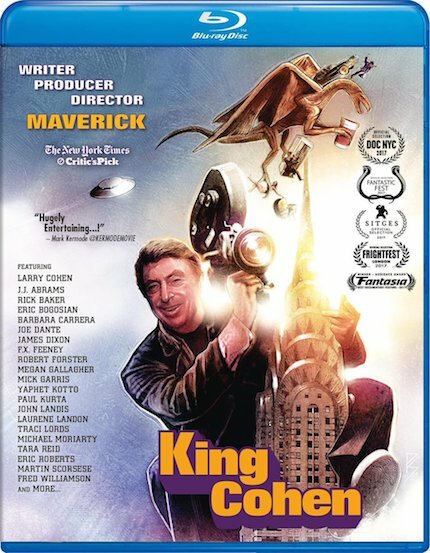 Out now, the limited Blu-ray edition of King Cohen also includes a CD soundtrack from composer Joe Kraemer, too. You can check out the King Cohen trailer below and find out more about the documentary on the film's site here.